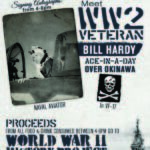 Come to McP’s Irish Pub at 1107 Orange St (near Hotel Del Coronado) to meet 97-year-old Hellcat Ace-in-a-Day Bill Hardy. Bill was flew in VF-17, which was on the USS Hornet, on missions over Iwo Jima and Okinawa. On April 6, 1945, he shot down five Kamikazes over Okinawa. Bill will be signing autographs for a donation from 4-6 pm, and partial proceeds of all food and drink purchased at that time will go the World War II History Foundation. We look forward to seeing you there! 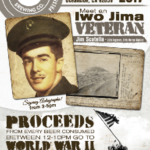 Meet Iwo Jima veteran Jim Scotella (5th Marines) on March 4, 2017 at Oceanside Brewing Company in Oceanside, California. You’ll have a chance to get his autograph (for a donation) from 3-5 pm, and ask him about his time in the service. Oceanside Brewing Company has generously pledged to donate 10% of all beer sale proceeds for the entire day – 12 pm to 10 pm – to the World War II History Project. Drink beer, meet a veteran, and support our mission of keeping WW2 veterans’ stories alive. Look forward to seeing you there – 312 Via Del Norte, Oceanside, CA 92058, near Camp Pendleton – on March 4! In 1987, at the 52nd anniversary dinner my father and I attended and sat next to a 3rd Marine who had a photo album of pictures. My father served in the 3rd Marines from ’58-’62 and they struck up a friendship. I had enlisted and was going to be heading into bootcamp that summer (although I would never get to go due to bad knees, a major disappointment in my life). The survivor’s name was Bob and he was from Washington. He told us the story that he had been hit on his landing and ended up in a bomb crater and laid there for about two days. Finally the body removal teams got to him and found he was still alive! Unfortunately the guy next to him was not. Apparently they threw the other person’s stuff on his stretcher and as it turned out, that guy was a combat photographer. After he awoke on the hospital ship the doctors told him they had saved his camera gear! He didn’t say anything, and after he recovered he had the film developed. A few months after the reunion he passed away and his wife had been instructed to send all of his photos to my Dad, which she did, but she never included a return address! These have been in our possession for over 20 years and I felt that some of the survivors might know someone in these photos, or recognize some of the locations. In any event, I have scanned a few, but have about 20-30 more that are very graphic… If any of you recognize, or know any of the individuals, please let me know. Hopefully someone will be able to help Finn out. Do you know anyone for whom these photos spark a flicker of memory?